Residents below the tallest dam in the United States near Oroville in Northern California were ordered to evacuate immediately on Sunday because an auxiliary spillway was in danger of imminent collapse. The Yuba County Office of Emergency Services urged evacuees to travel only to the east, south or west. “DO NOT TRAVEL NORTH TOWARD OROVILLE,” the department said on Twitter. State authorities and engineers on Thursday began carefully releasing water from the Lake Oroville Dam some 65 miles north of Sacramento after noticing that large chunks of concrete were missing from a spillway. 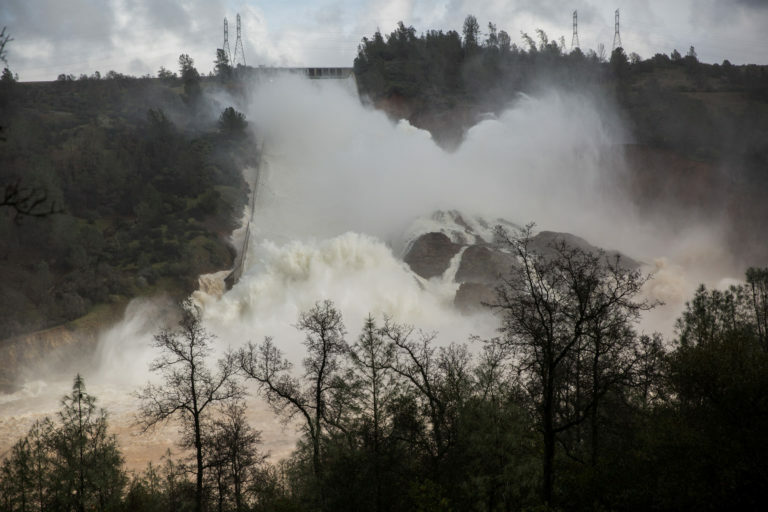 Water levels were less than 7 feet from the top of the dam on Friday as levels in the reservoir rose because of a California winter of heavy rain and snow that followed several years of severe drought in the state. The earthfill dam is just upstream and east of Oroville, a city of more than 16,260 people. Officials stressed that the dam itself was safe, but collapse of the spillway could cause flash flooding. At 770 feet high, the structure, built between 1962 and 1968, is the tallest dam in the United States, besting the famed Hoover Dam by more than 40 feet.